We’ve all heard of them before, seen them in movies and television, and probably driven past one recently. They can be stacked full of piles containing different metals or be lined with vehicles placed on top of one another while rusting together. Junkyards are businesses that buy used, and many times, past their prime of life, scrap metal. They are also involved with the business of car recycling. 1. What are junkyards for? Why would you want to go to a junkyard? As a vehicle owner and/or a homeowner, you may run into the chance that you need to scrap something which you don’t want to or can’t just throw away. When a vehicle is reaching the end of its running days and you believe it is no longer worth the investment to fix, it can be sold to a junkyard which will pay for it. There are a few things of metal which would be found around a house that can be taken and sold as scrap. That way metals are getting properly disposed of or being recycled and used for something new. Another popular reason that many go to junkyards is that you buy car parts for cheap through them. A great article discussing this can be found here. It doesn’t always turn out, because the part that you are looking for might either be in high demand or because they don’t have any of the vehicles which the part comes from. If you call the junkyard before visiting, they can search their database to see if they have any of the parts you are searching for. Junkyards also provide a great place for metalworkers and craftsman which rely on scraps of metal for projects. Give a local junkyard a visit, because you don’t know what you might find, over time there have been rare findings in a junkyard such as an old valuable car or some sort of equipment which may still be intact and usable. Most junkyards allow for customers to peruse the junkyard, then if they find what they are looking for, you must pull it out yourself. Some have assisted with this process, but if you are in need of assistance with this part, then consider visiting with a family member or friend. Be careful when searching through these heaps of metal as there can be things that cause injury if you aren’t cautious. Selling an unwanted vehicle can be a hassle, but junkyards should make the process easier. You may assume that there is a set price for your car, but there are several factors which go into determining the value of scrapable vehicles. The car itself is a big factor, whether it is in good condition or not, then they take into consideration who manufactured the vehicle along with the age of the model. This gives a good starting point. Other than the car, the next thing that impacts the value, is the current price of scrap metal. This is a value that changes regularly as it is affected by not only the US economy but that of the scrap metal economy internationally. If the junkyard you are dealing with has high amounts of a specific scrap metal, this can affect their decision of a final price. Not only is the value of scrap metal fluctuating on a very regular basis, but the demand for parts also cause the price to go up or down. Depending on where the vehicle is and how it is going to get to the junkyard can factor in, because they will have to take a towing fee out of your final price that they offer if they must pick it up. Not all junkyards charge this as some offer free towing with their service. Once your vehicle belongs to the junkyard, they determine whether they want to have the vehicle restored or to have it scrapped which then either recycle or discard it. There is a reason that junkyards have a bad reputation since many of them try to undercut people out of their profits or they will pay for scrap on a vehicle then turn around and have it fixed to sell. However, there are still reputable junkyards which pay the proper amount for your scrap and follow the laws and regulations involved in running a junkyard. If the right steps are taken to finding a proper junkyard, then it will be worth the effort. A great starting point is finding out whether the junkyard uses their own tow truck or if they pay another company to take care of this, most junkyards will have their own trucks which they will reduce from the final price if not doing it for free. Check first with the government's licensing board (Be sure to look for the one in your State) to make sure it is an established business that works under the law. Next, you can look at reviews left by other customers of the junkyard online, then as a last step try looking into the better business bureau to see if there are any records about the junkyard. Be sure to protect yourself through the process of using a junkyard. Another step is to have a set price determined before you get off the phone with the junkyard. Again, this final price should include what needs to come out of it for the towing of the vehicle unless you have a way to get it there. Some may even offer free towing. Don’t let the price change once it is set, not even when they arrive to move it, if the tow truck driver tries to add any fees that you hadn’t negotiate, then it is best to turn down the towing and look for another. That being said, if they try to take the car without giving you some form of payment, which should almost always be in cash. Be wary of checks, since checks can be fraudulent and bounce. The junkyard may try to offer to take care of all the paperwork required for filling out the ownership of a vehicle’s title, but it is advised that you have the title transferred over that way you can make sure it is taken care of and you won’t receive any problems with the ownership. If you feel that your gut instinct is a screaming scam, then there is a high chance that it is. Be well equipped with the knowledge you need, and it should be easy to determine which junkyards are legitimate and which ones are trying to make a quick buck at the client’s expense by cutting a few corners. Common replacement parts such as mirrors, windows, wheels, and more for cars cover junkyard grounds. A lot of it depends on the junkyard’s location for what sort of things you can find, but some of them contain old military equipment which is no longer in service. A junkyard serves as a great place to take your scrap to, but also a great place to go if you need to find any scrap metal. Scrap hobbyists have the potential to find vintage and valuable things hidden in the metal jungle. If you find yourself on the opposite side of the arrangements above, being that you want to buy a car from a junkyard, then there are a few things you may want to look to first. If you are buying a car from a junkyard, there is an extremely high potential that the car will be on a salvaged or rebuilt title. This means that the car has taken significant damage, usually enough to have someone or an insurance company take it to a junkyard. There can be a lot of problems following behind that salvaged title. The car might not be up to the standards needed to maintain driving properly and safely on the road. Many insurance companies don’t even consider covering a salvaged title, because of these types of problems. Why would they want to cover a vehicle that had already been damaged to a point where a previous owner or company trashed it? Another big concern that arises when looking to buy a junkyard car can be that the car is a lot worse off than is originally declared. There could be internal problems with the car that weren’t caught or addressed when the car was inspected for its damage. There isn’t much that can be done after a salvaged vehicle is purchased because nearly all of them will be sold as is. So, be wary of salvaged titles with the claims of only external damage. Along with insurance issues, some states require that you have a state police officer inspect the vehicle to ensure it is safe for you and others on the road before you can legally drive the vehicle. Junkyards serve multiple purposes and can be a place where you sell your old things to or a place where you can buy scrap and salvaged cars. Don’t be afraid of the idea that some junkyards are out to scam you, because the right ones are out there and have your best interest in mind. The common items found around a junkyard might be something of use to you like a car part you can’t drive without. After reading about so many issues that can arise when selling or buying from a junkyard, it may seem to be more of a hassle than it is worth. 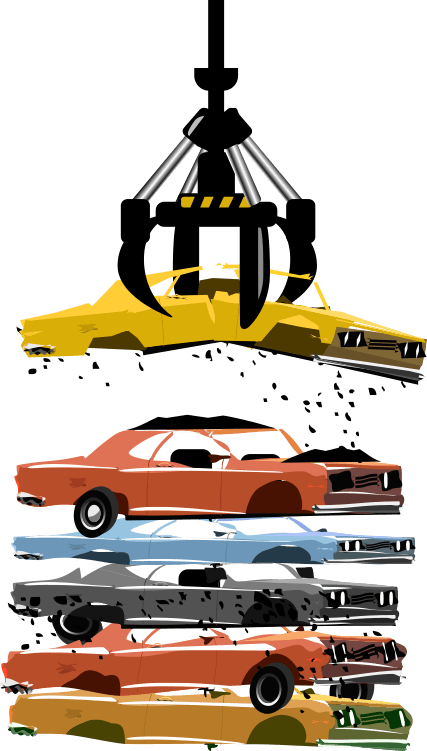 With the proper research, the junkyard process can go smoothly and help you to get rid of any unwanted scrap or vehicles.